Scrabble players will now be able to use words such as “OK” and “ew” after US dictionary company Merriam-Webster announced it was adding 300 new words in the latest edition of the game’s dictionary. The last freshening up of the word list was four years ago. More unusual words have also been added, including “qapik” – a unit of currency in Azerbaijan. Before that, the rules allowed any dictionary to be used. However, the changes are not going to be allowed in the UK – at least for now, an expert says. 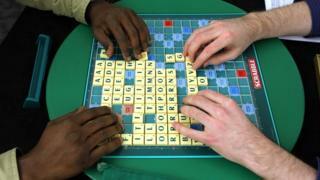 Natalie Zolty from the Association of British Scrabble Players told the BBC that the British dictionary – Collins’ Official Scrabble Words – was being updated in time for release next year. So, what words are added to the US dictionary? “OK is something Scrabble players have been waiting for, for a long time,” said lexicographer Peter Sokolowski, editor at large at Merriam-Webster. Qapik is now one of 20 words beginning with q that does not need a u. Other high-scoring words include bizjet (a small plane used for business), and other new words include food delicacies such as arancini, the stuffed Italian balls made of cooked rice, or macaron, the small French meringue-like filled round cake. The official dictionary now holds more than 100,000 words for the game, which is owned by Hasbro. Of those, other newbies include: aquafaba, beatdown, zomboid, twerk, sheeple, wayback, bokeh, botnet, emoji, facepalm, frowny, hivemind, puggle and nubber.